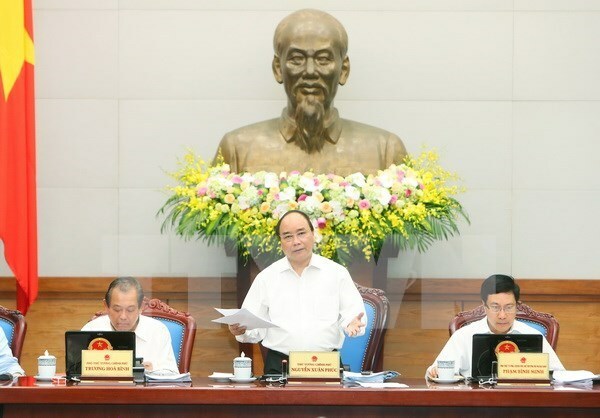 Hanoi (VNA) – Prime Minister Nguyen Xuan Phuc has urged ministries, sectors and localities to take more drastic measures to enhance the management in the remaining months of the year in order to realise socio-economic development targets in 2016. During the Government’s monthly meeting on October 29, which focused on ways to promote exports and accelerate the disbursement of public investment capital, the PM said to ensure a growth rate of 6.3 – 6.5 percent for the whole 2016, the growth in Q4 must be 7.3 percent. He also underlined the need to continue ensuring macro-economic stability and well implementing financial tools to keep the year’s inflation within 5 percent, saying relevant agencies must keep close watch on changes on domestic prices and take measures on management of prices, especially those of essential commodities, to avoid goods hoarding and rising price in the end of the year. Attention should be also paid to reforming credit, supporting enterprises in accessing capital and considering lowering interest rates, he stressed. The PM asked ministries, sectors and localities to quicken disbursement, and promote tax collection, speed up administrative reform in terms of tax and customs, and reduce expenditures. He urged for stronger efforts to promote agricultural development and new-style rural area building, effectively overcome consequences caused by natural disasters and make preparations to respond to others like saline intrusion and drought in the future. He noted that the agriculture sector needs to well control food security and timely prevent the use of banned substances in animal breeding and provision of counterfeit plant-protection medicines. Appropriate solutions should be devised to address difficulties facing enterprises, foster start-up movements, and accelerate restructuring of State-owned enterprises, he said. The PM called for strengthened investment promotion by seeking to boost links between global groups and Vietnamese enterprises in implementing business and investment projects. According to a report from the Ministry of Planning and Investment, the country recorded positive outcomes, particularly in investment climate improvement, official development assistance (ODA) and foreign direct investment (FDI) attraction, and the tourism sector’s strong growth. The consumer price index (CPI) in October increased by 0.83 percent from the previous month, a year-on-year rise of 4.09 percent. The CPI and economic growth in the whole year are set to reach between 4.7-5 percent, and 6.3 percent, respectively. The enforcement of the Vietnam- Eurasia Economic Union Free Trade Agreement in October opened opportunities for Vietnamese exports from now to the end of the year, said Minister of Industry and Trade Tran Tuan Anh. During the meeting, Cabinet’s members proposed numerous measures to expand the export of agro and fishery products – the staples in the remaining months of 2016 and the first months of 2017, stressing the need to focus on potential markets. They also suggested improving competitiveness of rubber, coffee and garment-textile enterprises. In conclusion, the PM said each ministry, sector and locality must outline action plans for 2017 to create more breakthroughs in the year./.